Is Weighted Blanket Worth it? Weighted blankets are heavy therapeutic blankets filled with poly pellets of glass beads which work by applying deep pressure stimulation. When used properly, weighted blankets may help fight insomnia, depression, relieve anxiety and stress, and improve concentration. Despite numerous benefits, weighted blankets can be potentially dangerous when used by young children and require you to remain vigilant about safety rules. Weighted blankets may cure your insomnia, relieve chronic stress and anxiety, and make you happier. I’ve spent dozens of hours examining the issue of weighted blankets: delved into scientific studies, read hundreds of reviews and even tried one myself. Here’s everything you need to know about this wellness trend: what weighted blankets are, how they work (and do they? ), who can benefit from their usage and what health risks they may pose for the loved ones around you. 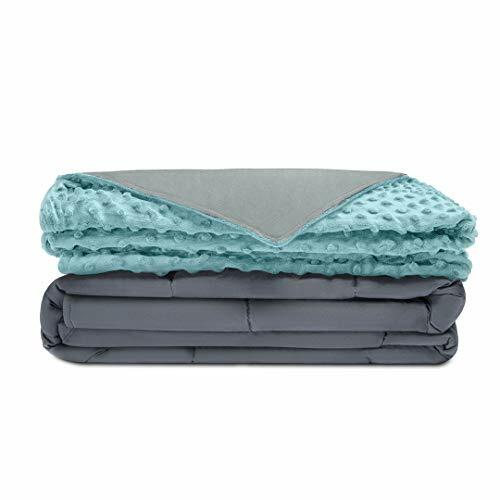 Meet our top pick – the Quility Premium weighted blanket made of natural breathable cotton and filled with glass beads. Soft removable cover is easy to clean and remove in case you feel too hot during the night. 7-LAYERED PREMIUM BLANKET: Quility's innovative 7-layered blanket is designed to offer supreme comfort. We use the most advanced sewing technology and the highest-quality materials to produce the ideal weighted blanket. The ultra-breathable, 100%-cotton outer layer is lined with non-glue polyester padding and two extra polyester layers that contain millions of premium micro glass beads. This unique structure provides optimal temperature control and guarantees that our blankets never leak beads. COMPLETE SET! MINKY COVER INCLUDED: Soft-to-the-touch and super-comfy, a Quility premium removable minky duvet cover accompanies every purchase! Use the cover for added warmth during the winter, and remove it to keep cool in the summer.To remove it, simply unzip the zipper and untie the string ties fastened to the loops around the blanket's edges! GREAT NIGHT'S SLEEP: Quility's all-natural heavy blanket provides the warmth and comfort of a gentle hug. Sleep soundly throughout the night and wake up feeling renewed! The idea is pretty straightforward: these are customizable blankets that are heavier than your average duvet. They consist of two pieces of fabric sewn together and divided into square pockets. These compartments are stuffed with a filling to give the blanket weight. Weighted blankets are supposed to give you a swaddling feeling of security and comfort by restricting your movements and pressing you down to the ground. Weighted blankets work by applying deep pressure stimulation. It is a form of therapy that uses pressure and sensory input to produce a calming and relaxing effect. The magic science behind weighted blankets roots in the autonomic nervous system (ANS). ANS receives the input from the external environment and regulates involuntary body functions in response to the stimuli. For example, you get goosebumps on your skin when feeling cold or nervous or start sweating when stressed. ANS consists of 2 divisions: the sympathetic and parasympathetic nervous systems (SNS and PNS). SNS prepares the body for dangerous or stressful situations whereas PNS controls body processes during normal conditions. Deep pressure stimulation modulates the activity of both systems by balancing out the body response to external inputs and helping with emotional regulation. Deep pressure stimulation triggers a chain of beneficial internal changes, particularly in hormone levels. It increases serotonin and dopamine levels, the “hormones of happiness,” which in their turn improve sleep, help relieve depression and in general make your day. That is why a massage or a firm hug feels so good. Deep pressure stimulation also showed potential in decreasing hormone cortisol – which manages stress response and metabolism – and boosting the production of melatonin – the hormone that regulates sleep patterns. The need for deep pressure stimulation stems from childhood when parents were providing us with ‘tactile comfort’ by holding, cuddling or hugging. The American psychologist Harry Harrow suggested that infants naturally yearn for a physical contact and cling to something for emotional comfort. In his famous experiment, the researcher tried to find reasons for baby monkeys to bond with their mothers. Infants were split into two groups; each provided with a surrogate mother, one made of wire and another covered with a soft cloth. When researchers tested the monkeys’ responses to different situations, the behaviors of the two groups varied greatly. In times of fear or distress (e.g., caused by a moving toy bear), baby monkeys who grew up with a soft-cloth mother would run and rub themselves against it for comfort. The bravest of them would soon overcome their fear and even approach the frightening object out of curiosity. In contrast, the infants raised by a wire mother would not rush back to it. They would clutch themselves, scream and engage in convulsive rocking movements which reminded of the behavior of autistic human children. Children with ADHD may benefit from the use of a ball blanket, a type of a weighted blanket, according to Danish researchers. After using a ball blanket for two weeks straight, children’s activity levels and attention span improved by 10 %. Swedish researchers reported that deep pressure, such as provided by the weighted blanket, alleviated the feeling of distress, promoted the sense of calm and increased sleep time, after conducting a four-week experiment. Participants stated that they found it easier to settle down to sleep and felt more reinvigorated in the morning. There is a correlation between deep pressure stimulation and improved sleep quality in adults. Researchers tested twelve subjects with complaints of disrupted sleep and increased stress levels. Participants were grounded with a conductive mattress pad during sleep for 8 weeks straight. The results showed a significant decline in the levels of cortisol at night. The subjects reported improvement in sleep, and elimination or reduction in other symptoms such as anxiety, stress, and pain. The use of Ball Blankets significantly reduces the number of nights that the ADHD child spends more than 30 min falling asleep from 19% to 0%. Weighted blankets, however, did not help children and teens with autism spectrum disorder (ASD) to overcome sleep issues. There was no increase in total sleep time or efficiency after a 2-week trial period, according to the study. Though parents and participants preferred using a weighted blanket over the nonweighted one. Weighted blankets may also reduce the activity of the nervous system. A small study showed that more than half of the participants reported lower anxiety after use, and 78% preferred the weighted blanket to reduce distress. The available evidence shows promise in applying weighted blankets for managing Posttraumatic Stress Disorder (PTSD) in veterans. Are you struggling to get a decent sleep every night? Are you a fidget in bed? Do you often experience social anxiety or stress? Do you like wearing hats, heavy long sleeves as a way of applying pressure on your body or holding objects on your lap? If you’re nodding to at least one of them, then you may want to try out a weighted blanket. In case you own a pet who responds a bit too anxiously to long car rides, loud noises or new people, then here’s good news to you folks! Weighted blankets are not just for people and might be beneficial in calming your dog and help it relax. 25% of U.S. adults develop insomnia every year. That’s double the population of California. 31.1% of U.S. adults experience any anxiety disorder at some time in their lives. 10-20% of children and adolescents experience mental disorders worldwide. In August 2014, a 7-month-old Owen Haber was found not breathing in his crib at a child care center in St. Luis. The baby weighed about 19 pounds and a weighted blanket found crumpled below his waist was nearly a quarter of his weight. The investigation determined Sudden Infant Death Syndrome or SIDS as a cause of death. Sleeping on a stomach as well as excessive bedding or clothing increase the risk of SIDS. Whether a weighted blanket played a major role in the fatal outcome is questionable, but its misuse is obvious. The excessive weight might have restricted the infant’s movements preventing him from rolling to his back at night. In April 2008, Gabriel Poirier, a 9-year-old boy with autism, behaved restlessly during the class. When the boy ignored the remarks to calm down, the teacher applied a more therapeutic punishment technique and rolled the child into the blanket from toes to head. After 20 minutes the boy was found inanimate; he fell into a coma. Gabriel died the next day. Check the blanket for damage regularly and never give a child a damaged item. When choosing a weighted blanket, the general advice states that its weight should not exceed 10% of the user’s weight. The rule applies to anyone, be it an adult, a child or a pet. You may add a kilo or two, though it is not recommended to exceed the limit when choosing a blanket for your child or a pet. Weighted blankets come in various types, colors, and sizes. Natural materials such as cotton blends are the most practical and durable. They are breathable and will prevent you from sweating at night. Percale is excellent for summer. It feels cool and crisp even during the hottest days. Fleece, in contrast, adds warmth and will be best suited for the winter season. Pick a color according to the season when you’ll be using the blanket. While light patterns reflect the sun during the day, darker ones are easier to maintain. You may choose any size according to your physical characteristics. Make sure that the blanket doesn’t drape over the bed. 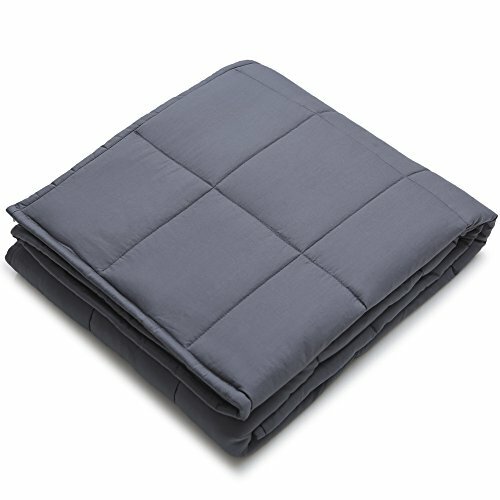 King size weighted blankets for two people are widely available as well. Filling varies from poly pellets (typically used to make stuffed toys) or glass beads to rice and barley – the first two being the most common. Poly pellets are the most versatile non-toxic filler. It will not mildew or sprout as opposed to rice, for example. Poly pellets look like pea gravel and are a bit bulky. Glass beads look similar to sugar and are denser if compared to poly pellets. The blanket filled with glass beads may have a more flowing-like texture. Regardless of the weight and the filling, most of the weighted blankets now can be washed on cold and tumble dried. I can be a bit too emotional at times, I love hugs and can’t fall asleep without covering myself even during the dog days of summer. So I was excited by the idea of trying a weighted blanket myself. It all rounds up to a goodish sum of money. After all, you don’t want a blanket which will fall apart after the second laundry. If the price bites or you’re feeling more adventurous, then why not try making your own weighted blanket? There are many tutorials which provide excellent advice on how to do a weighted blanket by yourself. You can make your blanket adjustable so you can add or remove weights when needed. For those ham-handed just like me, there’s a great tutorial on a no-sew weighted blanket. I didn’t want to pay an arm and a leg for my first weighted blanket. This one is reasonably priced plus it includes a removable cover (usually not included in the price). It is filled with poly pellets and is suitable for both winter and summer. I’m cold all year round so being hot is not an issue for me. It is also simple to take care of. There’s no need to clean the whole banket often as long as you wash the cover regularly. Our weighted blankets are designed by Melissa Hartwick, a former bridal designer and special needs mom. MADE IN THE USA! Blankets are custom made to order here in Charlotte, NC and ship within 1 week of order date! Honestly, it was a tough choice. I fell in love with the number of patterns they offer. 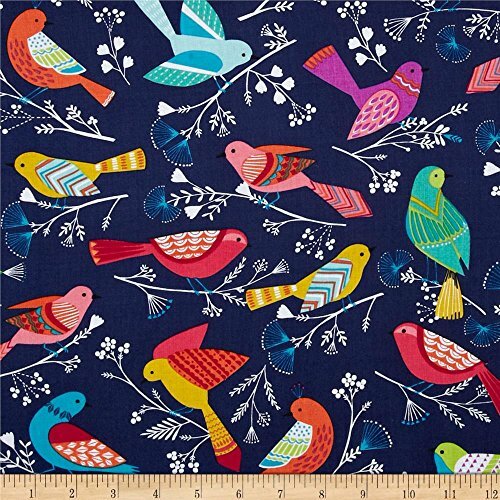 But since the child inside me couldn’t make the decision and this blanket did not include a cover and had fewer reviews, I bookmarked it in case I need a second blanket in the future. Choose the blanket that weighs about 10% of your body weight plus one, 20 lbs weight is intended for individuals weighing about 190 lbs. Please note, the size 48''x72'' maybe too short for people tall than 5'5" and too narrow for people like tossing and turning on bed. A twin, queen or king size weighted blanket is much smaller than twin, queen or king size regular blanket. The blanket is made of 100% cotton and is filled with glass beads instead of poly pellets. People say it is less noisy, but if the blanket rips, it would be a real headache to clean all the sugary glass beads in the house. Man does not live by weighted blankets alone. Some other goods that provide deep pressure stimulation include weighted vests or lap pillows. A squeeze machine is a more radical tool and is used for autistic patients. It is constructed of 2 sideboards covered with soft padding which form a V-shape. The user lies between the sideboards and controls the squeeze pressure distributed evenly across the body. If you found the squeeze machine eerie, take a look at a weighted limb-blanket. Americal artist Mia Cinelli’s was inspired by traditional weighted blankets and designed her artwork “The Weight.” The artist states that it helped her to ease feelings of grief when her fiance’s father passed away. Sensory clothes, such as shorts or tank tops, designed to benefit those who suffer from Sensory Processing Disorder, Asperger Syndrome, ADHD and anxiety might help you stay focused and calm throughout the day. They provide compression to your body and regulate the work of the nervous system. There are also plenty of alternatives depending on the nature of your problem. Melatonin supplements, for instance, may help if you are a shift worker or temporary suffering from insomnia or disrupted sleep. Or try exercise if you’re feeling down or depressed. It increases the production of serotonin in the brain and contributes to the feeling of happiness and bliss. When covered with my Quility blanket for the first time, what struck me the most was that it was indeed heavy! I almost started to regret that I didn’t order the lighter one. The feeling wore off after a few minutes though. The blanket helps me to settle down to bed faster than usual and makes a midday nap more pleasant. I suppose because it’s harder to move under it. I also love the hugging sensation it gives me. When I feel overexcited or in a low mood, and my boyfriend is not around, I toss the blanket over my shoulders and it makes these bad moments a bit easier to bear. Weighted blankets are not a panacea and do not seem to work for everyone. I’ve come across many reviews from dissatisfied customers. Some compared weighted blankets to a ton of bricks. Others said that instead of relief, it became harder to fall asleep. In contrast, there are also hundreds of pleased buyers who claim that they got rid of insomnia and managed their stress better. After all, it is a highly personal experience. The only way to understand if deep pressure stimulation works for you is to try a weighted blanket yourself. Did you ever use a weighted blanket? Can you recommend any good weighted blanket for dogs? There aren’t many weighted blankets made especially for dogs. But you can easily choose a weighted blanket designed for children that will perfectly suit your dog. Just keep in mind the golden rule that the weight of the weighted blanket should not exceed 10% of the user’s weight. Also, carefully observe the reaction of the dog during the first use of the weighted blanket. Canine Coddler Weighted Blanket is designed specifically for small and medium dogs and comes in 2 sizes. It’s practical and easy to take care of because it comes with a removable machine washable cover (you will most probably want to wash your dog’s blanket more often). The gray color of the cover also makes the stains less visible. This Huggaroo Weighted Blanket is designed for kids but will be suitable for dogs as well because it’s small (with the dimensions of 36 x 48 inches) and machine washable. Just make sure to check if the weight fits your pet. I’ve got a serious anxiety disorder, but those things help me to calm down a lot. I don’t really know how it works from a scientific point of view, but it just helps me fall asleep more easily. The downside is I sweat a lot using them. Hey! Thanks for your feedback. Glad to hear that the blanket works for you. You might want to try a special electric mattress topper which allows you to cool your mattress when you’re feeling hot (it also has a heat option for winter months).